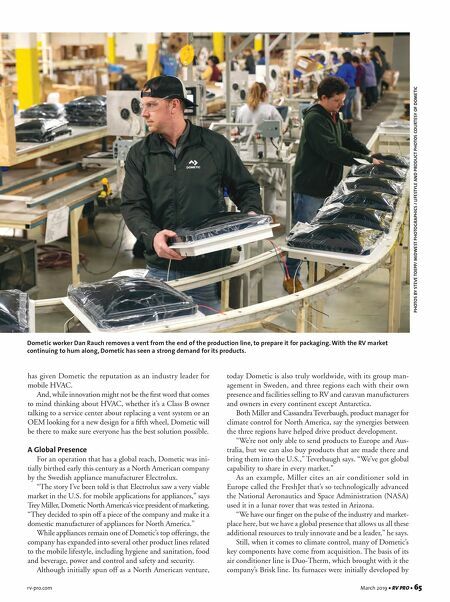 64 • RV PRO • March 2019 rv-pro.com O R I G I N A L E Q U I P M E N T J ust about everyone in the RV industry recognizes the name Dometic. However, a name that to one person may represent the best in refrigerators or toilets suggests water heaters to someone else. There are some key commonalities among all Dometic products, though. One is a deep understanding of mobile living and the mobile lifestyle, whether it's on the road in an RV or truck, or on the water. Another is innovation. Nowhere is that more evident than with the company's HVAC (heating, ventilation and air conditioning) products. A combination of organic growth and the acquisition of some of its key competitors The supplier might be best known for its refrigerators, toilets and awnings, but it's also a power player in the HVAC segment. By K. Schipper Dometic Keeps It Cool (and Hot) Trey Miller, Dometic North America's vice president of marketing, and Cassandra Teverbaugh, product manager for climate control for North America, are pictured in the company's Elkhart, Ind.-based facility where air conditioners and vents are manufactured. 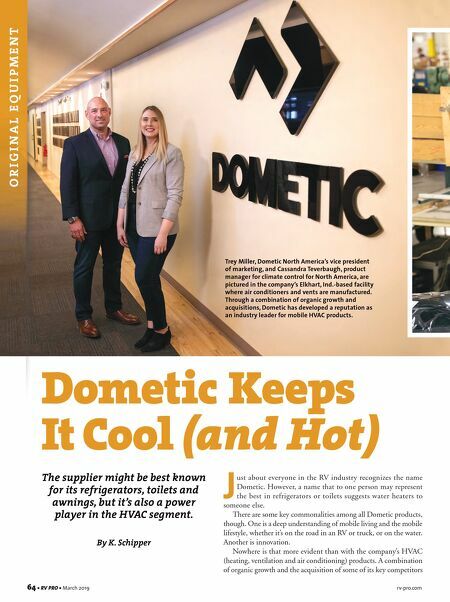 Through a combination of organic growth and acquisitions, Dometic has developed a reputation as an industry leader for mobile HVAC products.